DFM faculty and staff, members of the Red Cliff and Sokaogon tribes, and other collaborators kicked off a new partnership to increase alcohol screening and intervention at tribal clinics. A new partnership between UW Department of Family Medicine (DFM) researchers and two Wisconsin American Indian tribes aims to increase alcohol screening and brief intervention (aSBI) at three tribal clinics. Over time, the initiative could reduce risky drinking and alcohol-related harms among American Indians, ultimately improving the health of this at-risk population. The project (working title: “Wisconsin aSBI/CHOICES Tribal Initiative”) is supported by a 4-year, $1.1M cooperative agreement from the Centers for Disease Control and Prevention. The DFM team consists of Georgiana Wilton, PhD (principal investigator); Alexandra Adams, MD, PhD (co-investigator); Angelica Salinas, MS, CRC (project coordinator); and Barbara Vardalas, MA (project evaluator). They’ll provide training and technical assistance to the Red Cliff Band of Lake Superior Chippewa and the Sokaogon Chippewa Tribal Community as tribe members and clinic staff develop aSBI programs at three clinics there. Research has shown that aSBI programs effectively reduce alcohol consumption, alcohol-exposed pregnancies, and alcohol-related mood disorders, injury, disability, and death. Although aSBI programs do exist in some Wisconsin primary care clinics, there has historically been little funding and few resources to support their development at clinics that serve primarily American Indian patients. The project also includes collaborators from other educational institutions, the Wisconsin Women’s Health Foundation, the Great Lakes FASD Regional Training Center, and the Great Lakes Addiction Technology Transfer Center. 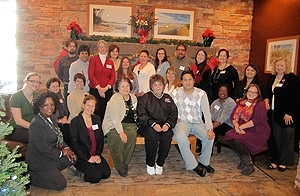 All of the partners met in person for a kickoff summit, held December 12 and 13, 2013, at the Red Cliff reservation near Bayfield, Wisconsin. There, tribe members and clinic staff learned about different aSBI program tools—in part through a “gallery walk” of posters describing the tools and featuring Native American art—and chose the ones they preferred. They also signed up for workgroups focused on intervention adaptation, protocol development, training, evaluation and sustainability. She also said that project partners are beginning to identify additional means of financial support beyond the CDC grant to help sustain the initiative over the long term. Project workgroups will begin meeting in January, with the goal of having an aSBI program launch plan ready by the summer. They will then bring that plan to the Red Cliff and Sokaogon tribal councils, who give the final approval on whether and how to implement the programs in the clinics over the next three years. The tribal councils also choose what the project will ultimately be called. Dr. Wilton said each tribe might bestow its own name to the project, and then together choose one shared, common name—a possibility as both tribes share Ojibwe (Chippewa) as their native language. Why? Because among the Chippewa, you never say goodbye.